Initially I wanted to call this a Quadrology. But the word doesn’t seem to exist. Then I wanted to dedicate it to Bob & Mary. They are my biggest T-suppliers. Each year they come flying from their hometown, close to Seattle, to Amsterdam. They leave me with lots of bottles of beer. I drink them. But forget them too. Hm, that’s the disadventage of tasting, I think. 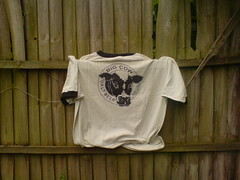 At home, at their Cask Ale Club, they collect T’s. So they can leave them also at mine. I can’t forget those, because I wear them all year around. Bob & Mary love the Quad. They have several ‘years’ standing in their beercellar. To let it mature. The Quad, that means La Trappe Quadrupel. I love that word. Here’s a Quadrology, although it doesn’t exist.